I saw a young patient in my office today who came in because of pain on her tongue. When I looked in her mouth she had small sores on both the right and left sides of her tongue and she complained of pretty strong constant pain sensations that become worse anytime she chews, talks, or especially when she eats. Her condition was a pretty classic case of canker sores. If you’ve ever experienced this, you know how uncomfortable and irritating cankers can be. We see dental emergencies each day in our Orem dental office and would like to offer a little information and advice to help you next time you have to deal with a canker sore. Although extensively documented and researched, canker sores are still not well understood. Medically called aphthous ulcers, canker sores present as small crater-like ulcers that are white in appearance and can be quite painful. They can come one sore at a time or in bunches. They can be small or quite large. They can be present on the insides of the mouth, the throat, the tongue, the lips, of any combination of the above locations. Multiple factors have been linked with canker sores, including stress, mouth injury, spicy foods, vitamin deficiencies, and autoimmune disorders. They are not contagious. Many people confuse canker sores with cold sores, but they are very different in cause and in treatment. 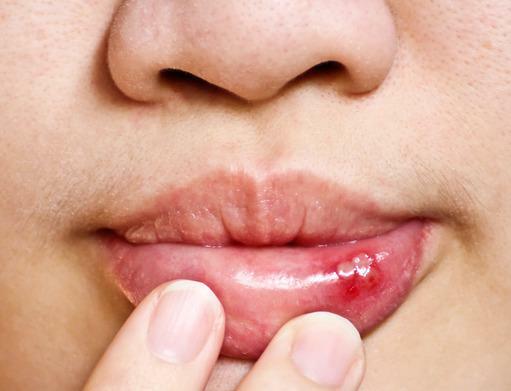 Cold sores (also known as “fever blisters”) are caused by a virus. Cold sores generally occur right where the skin meets the lip and the sores. Cold sores weep and then eventually form a scab. Unlike cankers, cold sores are highly contagious and once you have them, you have them for life because the virus finds a safe refuge in the nerve tissues in your mouth. This doesn’t mean that you actively have cold sores for the rest of your life once you get one. Most of the time your body’s natural defenses can keep the virus at bay, but in times of stress or sickness, when your immune system isn’t functioning at 100%, the virus comes out of its dormant stage and the sores return. Although they can be painful and highly annoying, most canker sores go away on their own without requiring any treatment. Because canker sores are still not well understood, there is no cure; any treatment for the condition is palliative only (any treatment is purely to make you comfortable until the sores heal). Special mouth rinses and ointments are available to help with discomfort and you can also take pain relieving medication such as Tylenol and ibuprofen. We highly recommend a rinse called Canker Compound that is that is made exclusively by a pharmacy close to our Orem dental office which is available by prescription. Spicy foods and citrus fruits should be avoided, because they can aggravate the sores. Toothpastes and mouth rinses containing sodium lauryl sulfate, a cleansing ingredient, should also be avoided for the same reason, and good hygiene practices should be maintained. Other than these few preventive and discomfort-relieving procedures, there isn’t much that can be done besides being patient. Eventually the sores will heal on their own, even with no intervention. If you frequently have problems with canker sores, you may have a medical condition or underlying illness that should be investigated. Lupus, Chrohns disease, Celiac disease, and autoimmune problems all predispose someone to having problems with canker sores. Certain vitamin deficiencies also have a strong connection with canker sores. Genetics probably plays a role to some degree as well, with some individuals being more prone or more resistant to getting canker sores, but if you seem to constantly struggle with this issue, please have a conversation with your dentist and medical doctor.